Sarah: What do we do now that the portal's gone? Camilla: Ask Chanel, she'll know what to do with that big brain of her's. Carol: I, for once, agree with Camilla. Chanel: I would look for some sign of life, to know we're not going to die. Camilla: Like smoke, right? From a fire. Maya and Adelaide: . . . ? 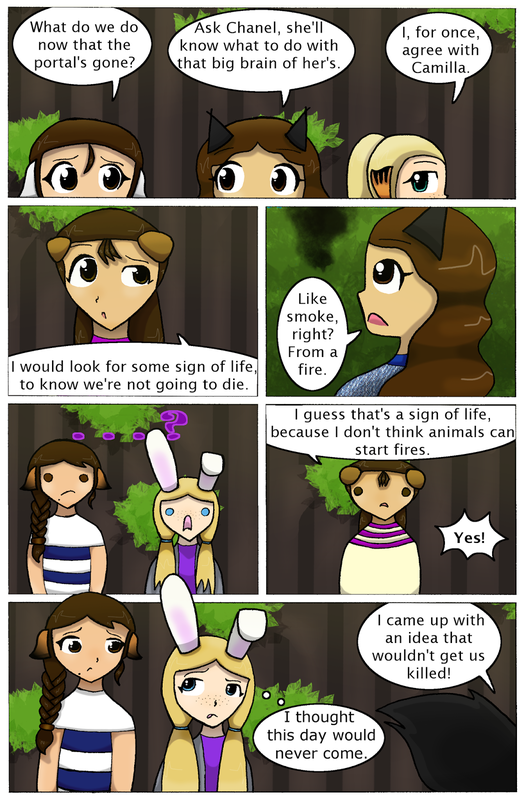 Chanel: I guess that's a sign of life because I don't think animals can start fires. Maya and Adelaide: I thought this day would never come. Camilla: I came up with an idea that wouldn't get us killed! I thought the colouring in this comic was better than previous ones. I messed with the lighting in this one, though you can't tell much of a difference. Also dodge/burned (lightened/darkened) a little more to add more dimension.